Yet my ‘fantastic’ HomePod can’t play Spotify natively. Great job, Apple. 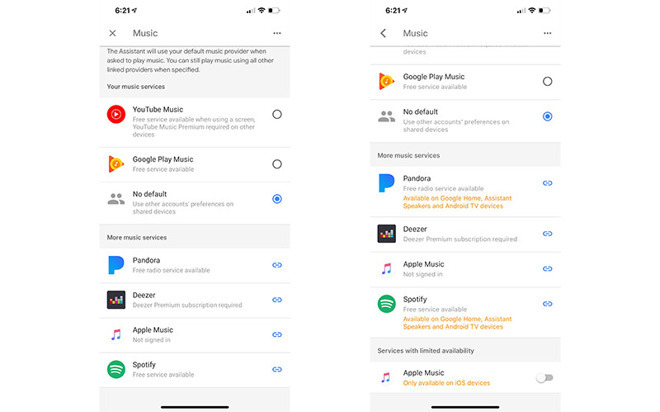 Maybe Google agreed to this inclusion as forgiveness for stealing iOS users data, or possibly Apple just knocked some money off the multi-billion Google search agreement. Now if Apple just improved Apple Music’s interface/usability/algorithms ala Spotify and offered an HD option ala Tidal that would make it much more attractive for many - me included. Apple clearly needs to convert Spotify users to build market - a playlist/preferences migration tool would also be cool and helpful. Getting the casual music listener on board is more challenging - mainly those that use Amazon Prime’s ‘free but limited’ music streaming on Amazon devices. I would be shocked if they were able to negotiate native inclusion on Amazon devices. Oh ... and Verizon’s offer of free Apple Music will help too. Bring other wireless providers on board and that will change the game. Apple Music is already on Amazon Echo devices, so I can see this coming to Google also. As for the Homepod, generally when Apple introduces something new, it's locked down for the first year and then opened up to 3rd party's after that. The Homepod was released 1 year ago this month I believe. So I assume a update, maybe it'll be iOS13 update where the Homepod is opened up to Spotify is others. But for now, Apple Music is my Default on my Amazon Dot and Ecobee 4 device's. I don't normally use them as I have a couple Homepod's, but it's something to play around with. Apple doesn't have to pay Google to be on their hardware neither does Google have to "apologize" by letting Apple have the "privilege". Quite the opposite. I just hope this isn't doom for Apple giving us more HomePod like devices. I really don't want either Amazon or Google monitoring everything I say or read. Except for the fact that you probably don’t own a HomePod. I mean why would you buy a HomePod knowing it wouldn’t connect to your favorite streaming service, Spotify. Your sarcasm appears fake and disingenuous. I own two HomePods. Just bought the second one this week. I don’t and won’t subscribe to Apple Music because I use another service that fits my needs better. This after using Apple Music again for 3 months. I just AirPlay is throughout the house and it works just as good.